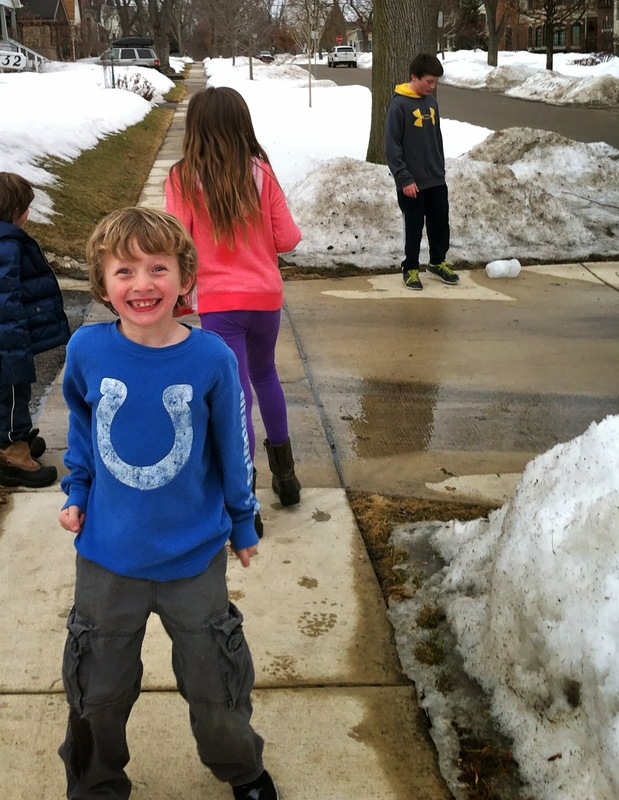 I've written a lot about how much we've enjoyed our very snowy winter. It has been fun. But something happened this week, something that changed well, everything. We had two days where the sun came out, the temperature reached a balmy 47 degrees and the snow started to melt. It changed us. We are officially over winter. Wade couldn't stop being amazed. "Grass! Mommy, loooooook I see grass!," he squealed. "My shadow! Sidewalk! Moooommmmy! It's going to be spring!!!" The rather ironic, some might say evil, thing is, that while I type this our area is under a winter storm warning. But it's too late winter, we got a taste of spring and we can't go back. Our spring fever has been sprung. Super Lucy's take on spring fever--a poetic study of the senses. I think it's perfect. I love my little writer girl. The first spring-ish day in Michigan after the snowiest, coldest winter in 133 years looks a bit...apocalyptic. Debris hidden beneath a foot of snow is revealed. The once fluffy snow becomes black melting slush. Potholes (and the wreckage they caused) from months of salt and subzero temperatures take over the streets. Sidewalks are cracked. 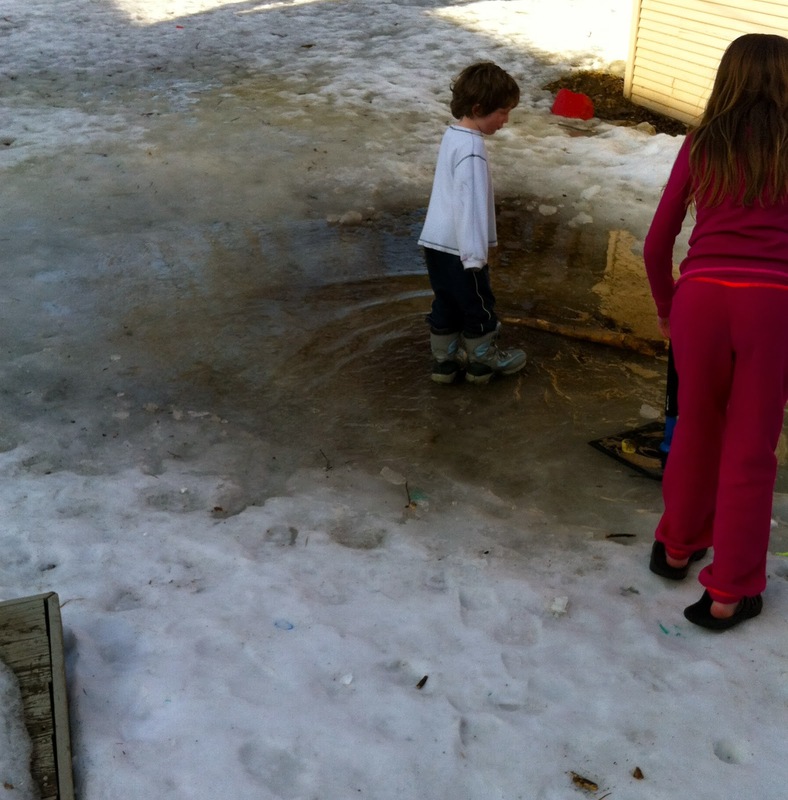 Ice patches where kids played hockey become murky, muddy puddles/ponds. People walk outside of their homes looking confused, squinting in the sunlight and greeting neighbors happily for the first time in months. Everyone, adults and children, have a somewhat crazed look in their eyes. Like animals that have been freed from their cages. You people in warmer climates might think I am exaggerating. But you people that live here, you know I speak the truth. We played on the front porch for the first time in forever and it made me so happy. I can't wait to live on my front porch again. It may not sound like the prettiest transition with the debris, the murky puddles, the dirty snow...but it is beautiful. It's beautiful because it means that trees with leaves, green grass, flowers and no need for coats and hats and gloves and boots and mittens and scarves is coming and we are ready. It's been fun winter, but we're over you. Bring on the great thaw of 2014 (yeah, right after the projected eight inches of snow we are supposed to get tonight). I'm happy and excited for you! Abbey and Dylan were so excited about the spring yesterday morning, too. Abbey kept talking about the smell, and I didn't have the heart to tell her it was going to do… well… what it did last night! I'm so happy you had those couple of days, even if it made you over winter. Ours was/is nowhere near yours... I can't even say I understand. But I felt the same way. How much snow did you get? Ack. I can't even, with all the snow. We had a taste of spring and are now anticipating getting snow on Monday. So over winter. At this point all of our snow is melted. Except for those rogue piles behind fences and backyard sheds that don't see any sun. Love the pics of your family enjoying the "warmth"!